It’s time to travel back in time to the early 1900’s when there were no social media websites to spread news with the click of a button and people instead patiently waited every morning for the paper boy to deliver their newspaper and view the headlines. The Extra Cash slot machine has been developed by NextGen Gaming and sees you take to the cobbled streets, which are complete with a red fire hydrant, as you assist the young and cheerful paperboy who works hard in his job for some extra cash to help his parents – and there is plenty of extra cash for you to enjoy for helping him out. 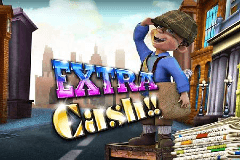 Extra Cash is a 5-reeled online slot machine offering 50 paylines with the paperboy appearing animated in 3D standing on top of a broken fragile wooden box. Assisting him on his mission to deliver the latest headlines to his regular customers you’ll enjoy Wild wins, Re-Spins to assist you in triggering a fantastic free spins bonus feature, plus there is also a gamble option to try and enhance your earnings – although this paper round certainly pays more than any I’ve encountered before! The newspaper with the ‘Extra!’ headline is the Wild symbol in Extra Cash while it can substitute for all symbols aside from the Scatter (which is a printing press), it is also the highest valued symbol with five on a payline resulting in a 500-coin win. On top of this the 3D animated paperboy could fling these Wild symbols onto the second, third or fourth reels throughout the base game or any reel during the free spins mode to create even bigger winning combinations. There is also a vintage newspaper van that delivers the papers to the local sorting office, a Beagle dog which will assist you in delivering the papers, newspaper stands where they are sold, a little red trolley that the paper boy pulls along the streets for doorstep deliveries, a huge bundle of papers, plus Ace to 10 icons which are worth less than the paper that has been printed on, as usual! The Extra Cash slot machine is all about the free spins mode, and there is a very helpful re-spin feature to assist you in your pursuit of spinning the reels for free and boosting your paper round income. Whenever you land two, three or four of the Scatter symbols (the printing press) the reels that contain a Scatter are held in place while those without a Scatter symbol are spun once again in an attempt to land even more, and thus provide you with an additional opportunity to trigger the free spins feature or increase the number of spins that you receive. Once you land enough Scatter symbols the New York Daily newspaper appears on screen displaying the number of free spins that you have been awarded. Pay attention to the small print too though as it states that any Wild symbols which the paperboy chucks onto the reels during your free spins will remain in place as sticky Wild symbols until the rest of your spins have been played. Unfortunately, you cannot re-trigger the free spins mode and the majority of the time I found it was the minimum of eight free spins that you trigger, however the inclusion of the sticky Wilds never fails to result in a successful delivery round with big tips chucked in from the local customers. The Extra Cash slot machine offers a fantastic theme where you assist a young paperboy trying to earn a little extra cash, and you’ll be hitting the headlines with the wins that you enjoy thanks to the sensational bonus features that are included. The paperboy will chuck Wilds onto the reels at random, a re-spin feature assists you in triggering the free spins mode and earning more spins than you’d have received, plus there is a gamble mode for those of you that want to transform your daily earnings into those of weekly earnings instead!